QR codes are very easy to set up and it is not necessary to have your own website. 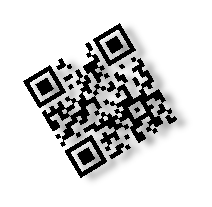 We specialise in storing your information and managing the connection to the QR code. This means no one is denied using the power of the QR code. We will shortly be providing the process to build your products online. Meanwhile contact us and our consultants will help you put together a package. If you are advertising in a magazine or newspaper you can include a code featuring your latest best offer, meal/deal of the week etc and change the information connected to the code at any time and any number of times at no extra cost within your rental period. This means there is no need to change your physical advertisement details while at the same time you are in a position to change the actual advertisement for nothing! QR codes can be enclosed with announcements made using a card or letter for events like births, marriages, engagements and could for example feature a picture of the happy couple and/or the baby and/or the new house. This saves paper and time and the codes can be updated at any point. Possibly not all at once! When you are in an exhibition you can place a small QR code next to your work which doesn’t distract but will supply the viewer with additional information about you and/or your work such as your Statement, your inspiration or maybe your CV. Once in a viewer’s phone it can be saved and shared easily. For instance a large QR code on a billboard would be seen by thousands of people who only have to scan it to have the details in their Smart phones to share and save. It could be used for marketing or any manner of information and be updated as often as required taking only minutes to do and for no extra cost. Not necessarily all at once. Embrace the new technology and make an impact. Send someone a very personal message expressing how much they mean to you. You can record yourself singing ‘Happy Birthday’ and include it with all your birthday cards for the year and then go on to record something different for next year at no extra cost. It is your QR code to do with as you wish for as long as you rent it. A standalone code is probably the easiest and the most cost effective as it’s FREE and no existing website is required. Also a good security aspect is that the most determined Internet hacker cannot reach you as the details are not on the Web! There is a limit to the amount of data you can put on a Standalone QR code before it gets too big to use - see recommended no. of characters in the Standalone QR code description. On the other hand a text code would allow a lot more information and a video could be sensational. But remember a video QR code requires very good Internet reception usually Wi-Fi level of quality. Like the Business card, information such as name, address, telephone number, email address, website details can be set up in a QR code which can then be used in a variety of places, including stationery, postcards, invitations, leaflets, stickers, badges etc. For a business, Christmas cards are the personal touch that can make a difference. In personal terms we are possibly contacting friends and relatives for that very important once a year connection. For both a picture of the staff or the family would be a good start. The very popular news letter at Christmas can be reduced to a QR code saving paper and postage costs. The rental period for this QR code can be as little as one month – peanuts but what an impact! This is a location based advertisement, namely on your door. It can look very high tech if printed off on acetate. If there is no Wi-Fi it’s probably best for now to forget Audio, Multi-Media and Video. That said, if you have a Website then a link QR code connecting to it when you are closed, can effectively extend your business hours. Link+ will give you feedback on how many scans have been made on the code. Whether it’s the Boat Show or the car showroom QR codes will be useful to provide information about the item being exhibited. Once scanned with the Smart phone the information can be saved and shared easily. Anything that is in the glossy brochure can be included in the QR code and of course it can be changed at any time and any number of times for free during the rental period. These QR codes could even be used for one exhibition after another and their contents changed completely. Long term rental becomes very cost effective. A QR code would be included in the advertising material for an event or exhibition to give further details relating to the exhibition possibly further images, a trailer, times of performances, extra information relating to the location, a website (FREE), directions to the exhibition or maybe details of the next exhibition and/or programme of forthcoming events. The basic statistics provided by Visance and included in the rental records the number of scans made on a code for a given period. This allows customers to draw some conclusions relating to how their different codes are being accessed. This feature can also be used to rate something by setting up a series of codes representing say excellent, good and poor and inviting people to scan on the relevant code. These scans can then be recorded and compared. The QR codes could be anywhere from on a wall, on paper or even on a screen. The QR code would appear on the flyer and possibly point to a blog spot or a relevant website or an area within the website (FREE). The information on the website can then be changed without having to change the QR code. Or it could point to information specially set up for the event/business which can also be changed at anytime at no extra charge for the duration of the rental. This gives enormous flexibility to the customer at no extra cost. QR codes can be used for location based games such as treasure hunts and site specific competitions. The QR codes could provide the rules, site map, give directions as well as the clues and answers. At the same time easy links to sponsors’ websites could be included. Once a competition has finished the QR codes can be used again for a new competition and so on for the duration of the rental period. Whether it’s a good luck card or a congratulations card an added QR code can make it that bit more special and personal. To include the spoken word or an image costs very little in terms of money and saves on resources. They can be included at the last moment as it takes just minutes to produce a QR code. A QR code on an invitation could be used for directions, places to stay, event information, local information anything that would help the event go smoothly while at the same time not cluttering up the Invitation itself. Heaps more information could be put onto a label attached to an item by adding a QR code. It might be a link to a website, a company statement, a competition, complaints procedure etc, all of which can be changed at anytime during the duration of the rental period at no extra cost. It is not necessary to have a website to put a QR code on your leaflet. A business or individual can set up a QR code to contain extra important information that will not fit or might change onto a leaflet such as references, past projects, special offers. This information can be changed at any time and as often as necessary within the rental period of the QR code for no extra cost and the leaflet does not have to be reprinted. An organisation such as a school could put their QR code on material sent home which can then be updated at anytime. For instance if the school was shut because of snow or the Fete was cancelled because of rain or making public their complete OFSTED report. Once in the hands of the parents the school would be able to get messages home easily, quickly and directly and at the same time saving on paper and resources at a very little cost in comparison and no extra costs for the changes. A manufacturer/supplier might like to give more information about the product or themselves on their packaging and this can be done by using the QR code. If used close up, which is likely on packaging it could be very small and yet contain tons of useful and interesting information. This information could change if necessary and this might mean the packaging does not have to, built in flexibility and money saved. QR codes can be rented for a year at a time after which the rental period can be easily extended. QR codes can be set up to give a preview of an event which would be printed on the publicity material. This could be a poster, leaflet or contained within a booklet of forthcoming events. A video QR code does require very good Internet access and should only be used where that is likely to happen. QR codes can be rented for as little as a month which might be useful if it is a one off production. QR codes can be printed on promotional items such as pens, mugs and T-shirts and the information they are linked to can be updated and changed even after the items have been taken home. Special Offers, vouchers, competitions, last minute deals etc. can all be easily set up using QR codes and updated as and when required and as often as needed. Once set up the QR code belongs to the customer for the length of the rental period and it can be changed at any time for no further charge. Letterheads, compliment slips, invoices etc. could all carry a QR code when scanned could give extra useful or image enhancing information about the company/business. Maybe a forthcoming event or a successful project just completed. This extra information can be updated at any time for no extra charge. As well as their name an organisation/individual sponsoring an event could have their QR code included in the publicity material and that would make it possible to get across to the public a lot more information about them, making much more of the sponsorship deal. The extra information could for example include a special offer from the sponsor. Instead of a weathered patch of paint that leaves you guessing what direction to go in a QR code mounted in a long lasting plastic case cannot only give clear directions but also tell you what to look out for along the way. Definitely enhancing the experience without using materials that need to be replaced while at the same with the functionality to update and improve the information at any time. In an area with very poor Internet reception such as the middle of a forest the Standalone code would need to be used. A QR code on the side of a vehicle provides an easy way for a prospective customer to take a note of the information. A quick scan and the details of the company/business can be saved and shared on the Smart phone. This could be done by a passing car with no pencil to hand in seconds. When a shop/business/gallery is shut a QR code in the window would take a potential customer to their website or to information about their business. This information gets seen immediately and if the observer is interested it is easily saved and/or shared with 100% accuracy for future reference. Remember you can only use the Link or Link+ codes if you have an existing website.